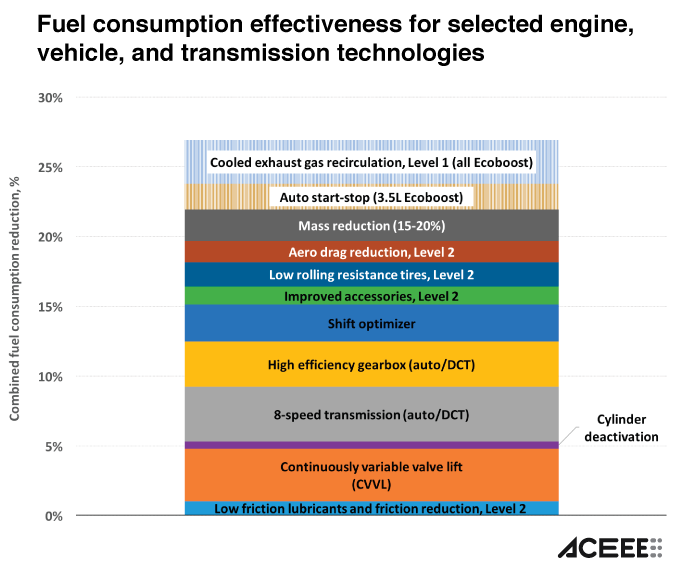 Recent press accounts of automobile fuel economy trends express concern that light trucks won’t be able to keep up with rising fuel economy (CAFE) standards. While most new model passenger cars are years ahead of their CAFE targets, only 40% new model pickups and SUVs are 2016 CAFE compliant. But sales of pickups and SUVs have surged in 2015, and this surge is likely to continue in 2016. Meanwhile, fuel economy and greenhouse gas standards for cars and light trucks for model years 2022 through 2025 are under review. Will lagging pickups really pose an obstacle to meeting the 2025 fuel economy goals? Since Ford’s F-Series has been the best-selling vehicle in America for 34 years, let’s take a look at the F-150 pickup (F-150 comes under light-duty CAFE, but not F-250 and F-350; they are heavy-duty vehicles). The F-150 has four engine options that, together with choice of two- or four-wheel drive, affect fuel economy. Ford has garnered much attention in recent years for its downsized, turbocharged “Ecoboost” engines in the F-150 (among other nameplates) and a 700-lb. mass reduction across all F-150 models. Thanks to these and other changes, many F-150s meet or exceed their 2016 fuel economy targets. But others, like those with the 5.0L naturally aspirated engine, do not. Using a Ford projection of sales shares of the various engines and assuming that two-thirds of F-150s will have four-wheel drive, we estimate that the average fuel economy of all F-150s sold this year will be 24.2 miles per gallon (mpg), falling a bit short of their 2016 average fuel economy target of 24.7 mpg. Additional credits for air conditioning efficiency and other “off-cycle”technologies should allow Ford to close that ½-mpg gap and hit the F-150 target for 2016 without difficulty. Looking forward to 2025, multiple technologies assessed by federal agencies in setting CAFE standards remain available to further increase fuel economy. All models can take advantage of advanced valve train technologies, greater transmission efficiency and shift optimization, aerodynamic drag reduction, low rolling resistance tires and further mass reduction, among others. Models with Ecoboost engines can adopt cooled exhaust gas recirculation. Start-stop technology, which saves fuel by shutting off the engine when the vehicle is at rest, is already standard with the 2016 2.7L Ecoboost engine, but will be new to the 3.5L Ecoboost starting in 2017. With the addition of the technologies shown in the above figure, all F-150 models except the 5.0L 4WD reach or exceed their average 2025 fuel economy target of 32.1 mpg (an estimate based on today’s size distribution of F-150s sold). Assuming the same shares for the four engines assumed for 2016 and two-thirds four-wheel drive, the entire F-150 line reaches its average target of 32.1 mpg in 2025 as shown in the figure below. But in fact, Ford could substantially exceed the 2025 fuel economy target for the F-150. We estimate that, if all models moved to turbocharged, downsized engines, for example, the F-150 could reach 34.1 mpg on average, 2.0 mpg over the 2025 target. Even if naturally aspirated engines remain in the line-up, they are likely to benefit substantially from advances such as high compression ratio and cooled exhaust gas recirculation (EGR). 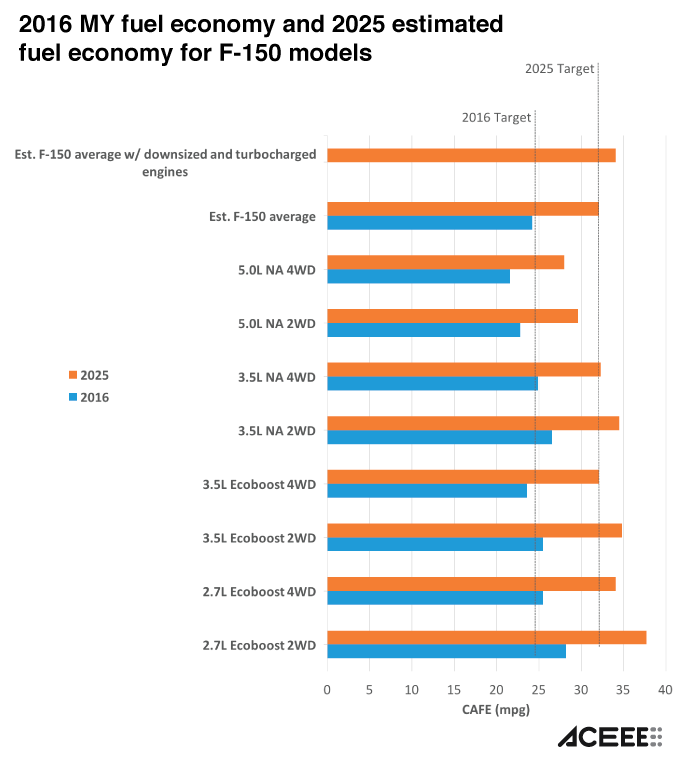 So it looks like the F-150 could go well beyond its 2025 target using well-known technologies, with no vehicle electrification (beyond start-stop), and without even taking advantage of the multiple flexibilities in the program that make it easier for manufacturers to meet the standards. If the F-150 is any indication, the real question for the agencies’ review of the 2022-2025 CAFE standards is: can we do better than previously thought?